Let's Fix FacebookFour ways to redesign one of the world's most-annoying, least-intuitive Web sites. Back in March, I asked people to quit whining about Facebook's redesign. It wasn't that I liked the radical changes the site had made—they were unquestionably terrible. In the past, Facebook would roll all of your friends' recently added photos, notes, and status updates into a few new posts a day; now the site shows you an ever-changing "stream" of activity, with new stuff from everyone in your network popping up as it happens. In other words, they made it just like Twitter. In an online poll that attracted more than 1 million respondents, 94 percent panned the new design. But I doubted the numbers: People always hate when their favorite site is redesigned. Lots of users were probably responding more to the suddenness of the changes than to the substance, and we'd all get over it soon enough. Five months later, I feel vindicated. Since the redesign, Facebook's growth has exploded. Comscore, the site's U.S. traffic in June was more than 25 percent higher than it was in March; between January and March, before the redesign, the site's traffic grew by only 7 percent. Fifty million people joined Facebook in the last three months—the site now has more than 250 million users. with more than 500,000 people signing up each day. Sure, the surge doesn't prove that people love the redesign—you could argue that the site would have seen even more traffic had it not messed with the design. But all those Facebookers who threatened to quit if it didn't undo the changes? They were bluffing. Indeed, Facebook's redesign has gone so well that I'm going to advise something radical: another redesign! And this time, fix all the bugs. Finding your own stuff is a pain. Say you're an investment banker who's trying to rehabilitate your industry's image, so you've just started a Facebook group called "1 Million Strong for Goldman Sachs!" Now you'd like to check the group to see how many hundreds of thousands of people have joined your cause. But where are your groups? You search the home page but find nothing. OK, maybe if you click "Profile" up at the top, you'll find your groups listed there. Nope. It turns out you've got to click "Profile," then find the tab called "Info" to see a summary of your groups—and if you'd like more details, you've got to click a third link, "See all." If you need to find the same groups over and over again, your best bet is just to bookmark them in your browser. This is a common problem on Facebook. If you're looking for pictures you posted three months ago, good luck. Sure, there's a button on the home page that says "Photos"—but if you click there, you see a list of your friends' photos, not yours. What if you click on the Applications button at the bottom of the page, and then click Photos? Wrong again: Now you see an array—not a list—of your friends' photos. The correct answer: To see the pictures that you've added, you've got to click "My Photos" at the top of this photo array page or click the "Photos" tab from your profile. Yes, there are at least three different links on the site labeled "Photos," and each one takes you to a completely different page. This is easy to fix. Facebook should add a link to the home page called "Your Stuff." This would take you to a page that lists your groups, your photos, and all your other things on the same page—not divided in multiple tabs. If Facebook wanted to be really nice, they'd sort this list in order of what you use most frequently. The "Highlights" section is useless. Facebook's home page is divided into two main sections. In the center, there's a quick-moving list of real-time updates. On the right, there's a stream that updates more slowly, labeled "Highlights." The trouble is, it isn't clear how Facebook decides which items deserve to be called highlights. For instance, yesterday someone I barely knew in college posted pictures from her friends' recent trip to California. Because those friends—who aren't my friends—posted several comments on one of the photos, Facebook assumed that the picture was a hot item. Now it's in my Highlights section—but I don't know anyone in the photo. Some items linger in Highlights forever, while others pop in and out in a flash—it's hard to tell what accounts for the difference. Worst of all, the section takes up space that would be better used for stuff I actually care about. One reader told me she often missed her friends' birthdays because the alerts were buried beneath the Highlights section. So, too, are your upcoming events. To view the remainder of this article click the link below. COMMENTARY: I have consistently jumped on Facebook's drab, boring and user-unfriendliness for months. I am a member, but I honestly don't understand why so many members can't live without Facebook. With 250 million members, when exactly will Facebook make money? The premise for writing to you is that we are actively looking for opportunities to invest, either in the open market or via structured PIPEs, in both public and private companies (willing to go public) with over $1.5M in run-rate EBITDA or Pretax Profit or over $1.5M in run-rate EBITDA or Pretax Profit with acquisitions. If you know of any public firms looking to raise capital or any private firms looking to go public in the United States through the reverse merger process and raise capital simultaneously feel free to contact me directly - work number US (914) 613-3002 or Japan (03) 6657 8339. We can let you know very quickly if this is an opportunity for us. Wakabayashi Fund is an investment firm focusing on the micro cap, small cap and mid cap industry. We are a risk adverse investor and utilize a bottoms-up fundamental research approach. Our focus is on profitable width '100%' companies or companies that are looking to make an acquisition to bring them to profitability. Do not utilize any short selling or hedging strategies with regards to any of our investment positions. Are long-term focused investor and never focus on any technical trading strategies in order to earn a return. We invest in public and private companies (when investing in private companies we will acquire them through an existing public entity shell). We implement an intensive due diligence process before making any investment. We pride ourselves on our efficient and thorough due diligence process, which allows us to close transactions in weeks, versus months for other private equity funds. Please contact me with any questions or comments about Wakabayashi Fund or with any investment opportunities that you believe would be suitable for us as an investor. The Daily Start-Up: Step Right Up, Guess Twitter’s Worth! Now that’s a lot of chatter. Spending behind word-of-mouth marketing hit $1.54 billion last year, according to PQ Media. While most traditional channels saw spending slow, spending behind w-o-m tactics including buzz, influencer, community and viral marketing grew 14.2 percent in 2008. Food and drink brands led the way accounting for 30 percent of all w-o-m spending. Reaching consumers via online communities like Twitter, Facebook and MySpace was an obvious priority for marketers. Spending increased 26 percent in those channels to $119 million, per the report. The largest amount of marketing dollars ($832 million) was dedicated for w-o-m strategy and consulting. W-o-m agencies grew 18.7 percent to $197 million. How much is Twitter worth? Many numbers have been thrown out there, but NeXt Up Research, a firm found by financial analyst Michael Moe, believes the micro-blogging service’s value is somewhere between $441 million and $589 million. NeXt Up’s analysis is based on comparisons with other companies and its own financial projections, which include an estimate that Twitter will generate revenue of $114 million to $134 million in 2013. That’s, of course, a wild guess, considering that Twitter, which is backed by $59 million in venture capital, hasn’t figured out a working business model. But in its report, NeXt Up does try to back up its projections rather thoroughly. The essence of the entrepreneurial spirit is to create a lot with very little, writes Stuart Ellman of RRE Ventures. He details how two entrepreneurs his firm has backed ”learned the pros and cons of what constitutes overspending” with previous companies. Today, these two entrepreneurs run a tight ship at their respective start-ups, understanding that “every dollar spent is a dollar that will have to be raised later.”…. There are six words to live by on the Internet, writes Fred Wilson of Union Square Ventures: open, global, mobile, social, playful, and intelligent. Only the last characteristic, Wilson says, hasn’t come to fruition yet as companies haven’t figured out a good way to make the Web smarter. After reading this scary story from The New York Times about how machines may outsmart mankind, do we really want the Internet to be that smart?…. You can download the free report here at SharesPost, which connects accredited buyers and sellers of shares in private companies, including Twitter…. Even as they struggle through the economic meltdown, vehicle makers can look ahead to a high-growth, flexible, global future. Automobiles designed for emerging economies are getting some attention these days. In March 2009, Business Week covered the launch of the celebrated US$3,000 microcar by Tata Motors Ltd. with the headline “What Can Tata’s Nano Teach Detroit?” A number of other vehicle makers, such as Mahindra & Mahindra and Maruti in India, Chery in China, and global auto companies such as Renault, Volkswagen, and GM, have been noted for the inexpensive cars they are designing for new markets. But the inexpensive microcar is only one small part of a much larger and more diverse trend. The motor vehicle manufacturing industry, which is 100 years old, is only now emerging from its infancy. Its time of greatest growth is yet to come. Automakers that are willing to think freshly about their markets and their business models will be in a position to benefit from the greatest wave of expansion that the industry has ever seen. It takes fortitude to make this assertion in 2009. Few people see the auto industry as poised for growth at all. Even before the devastation of the credit crisis, motor vehicle manufacturing was considered a mature sector, with static (or even eroding) markets and too much competition. Since the crisis began, the industry has been portrayed as beleaguered and hapless, with jaded consumers and deeply discounted products, and needing billions of taxpayer dollars just to stay afloat. But the reports of the industry’s death, and even the perception of decline, are greatly exaggerated. Look beyond its current challenges, and you can see increasing levels of productivity and capability, significant innovations in both the power train and the look and feel of motor vehicles, and — most important of all — a wave of accelerating economic development in many countries that will, sooner or later, produce immense new demand for personal mobility. To grasp these dynamics, we must first understand the automobile market, not as it is often perceived, but as it really is. Millions of people around the world are making their way into cities and seeking automobiles as a means to a better life. That momentum may have slowed in 2008 and 2009, but it hasn’t vanished. Research conducted recently by Booz & Company shows that the global customer base for automobiles over the next 10 years falls into three broad categories, based primarily on which countries customers live in. The rapidly emerging economies (REEs) consist of the so-called BRIC nations (Brazil, Russia, India, and China) and a group of other relatively wealthy developing nations, such as Malaysia, Argentina, Mexico, Turkey, Thailand, Iran, and Indonesia. Millions of families in these countries are making or contemplating the purchase of their first automobile. The lower-growth economies (compared to the REEs) consist of about 100 nations with relatively impoverished populations and poor economic prospects. However, their political leaders are interested in building up the middle class and see personal mobility as a major stepping stone. These countries may become markets for motorized transportation after 2020. The mature economies include the established industrialized nations in North America and Europe, and Japan. Population growth and vehicle replacement, rather than economic growth, will determine the market for automobiles there. These three groups add up to an enormous amount of market potential: Booz & Company estimates suggest that more than 370 million additional vehicles could be sold by 2013 and more than 715 million by 2018. But business models in the auto industry are not currently equipped to capture these increases. During their first 100 years, vehicle manufacturers (VMs) grew used to applying a single dominant approach to assembling and selling automobiles around the world. They sold similar vehicles with the same power trains through remarkably similar franchised dealer networks, with 80 percent of automotive sales and production based in the United States, Europe, and Japan. Click the link below to read the remainder of this article. COMMENTARY: If you are research the global automotive market, then this is a great source of information. In short: The ultimate luxurious, comfortable large sedan. This pretty effectively describes the Rolls-Royce Phantom, a grand motor car built from the ground up by using and improving upon state-of-the-art BMW technology and 100 years of classic Rolls-Royce tradition. It is a car like no other, and it would have to be with a price tag in the neighborhood of $350,000—give or take ten or twenty grand worth of options. The Phantom is as much of an experience as a form of transportation, and although certainly not for everyone, it is definitely a car that everyone dreams about. About 800 of these masterful creations enter luxurious service each year in the United States. 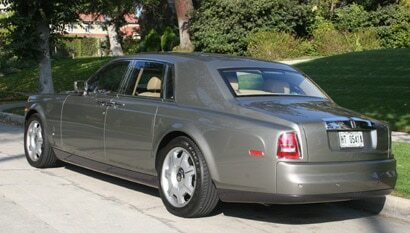 Many Phantom owners generally inhabit the supremely-spacious rear quarters while Jeeves whoever their chauffeur is guides this ultra-limousine down the Rodeo Drives and Fifth Avenues of America. What ol’ Jeeves will find is an unparalleled, often surreal driving experience. To begin with, the Phantom is big, really big. It weighs more than two Mini Coopers, is half a foot longer than a Chevy Suburban and is more than five feet tall. If that’s just not big enough, an even longer, extended wheelbase version is now available. When gazing out over the thin-rim steering wheel, the Spirit of Ecstasy perched atop the silver grille seems like it’s in another zip code, facilitating the need for an optional $3,300 split screen camera system that shows what is happening on either side of the bow when nudging into a street. Yet, beyond adjusting for its girth, the Phantom can be as easy to drive as a golf cart with feather-light steering that nevertheless provides plenty of feedback. 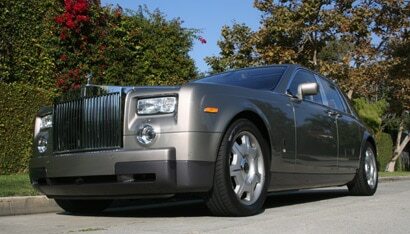 Just place your hands on the odd, chauffeur-friendly grips at four and eight o’clock, and the Rolls cruises with ease in a straight line on highways and city streets alike. All that girth is hauled around by a BMW 6.75-liter V12 under the hood capable of 453 horsepower and 531 pounds-feet of torque. Zero to 60 mph zips by in a scant 5.7 seconds, and accelerating that quickly in something so large never gets old. Unnecessary bursts of acceleration aside, the owner/passenger in back will appreciate feeling like a baby in a cradle, cruising in total comfort as if Jeeves is actually respecting the speed limit. A quick glance at the classic speedometer, though, could easily show an effortless and tomb-like quiet 120 mph. How BMW and Rolls do that is the third-of-a-million dollar question, but inches of noise-deadening materials and the wonderful suspension probably have something to do with it. While BMW provided only the last generation Rolls-Royce Silver Seraph’s V12 engine, now that they own the brand, many more facets of the Bavarian Motor Works have crept into this version—particularly inside. The column-mounted gear selector, iDrive controller (thankfully with separate radio and A/C controls) and even audible tones are similar to those found in the BMW 7-Series. Rest assured, though, that the interior is still a handcrafted work of art even more impressive than what you’d imagine a Rolls-Royce to be like. 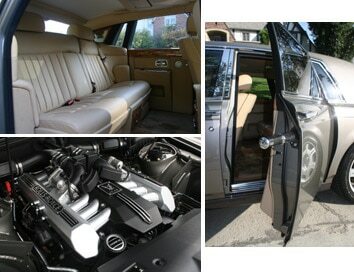 Every inch that isn’t covered with supple leather has beautiful veneered wood, chrome and other fine textures. Above all else, this is a car about details. The RR logos on the 21-inch rims do not spin with the rest of the wheels, remaining legible to commoners on the side of the road. There is an umbrella inside each of the elegantly nifty coach rear doors. The iDrive controller and screen disappear behind veneer wood panels. 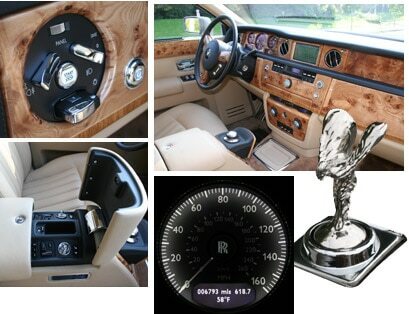 Plus, owners can personalize their Phantoms with a refrigerator, a humidor, a 24-carat gold Spirit of Ecstasy hood ornament and just about any exterior or interior color they wish (at a price, of course). Even the standard Spirit of Ecstasy disappears neatly into the grille when the car is locked for her own protection. Whether driving or sitting comfortably behind Jeeves in the back, the Rolls-Royce Phantom exudes a feeling of grandeur that is not an illusion. In many ways you could say this is the best car in the world. If you’re the type of person, like Sir Henry Royce himself, who strives for perfection in everything you do (and have the cash), why not get the very best that exists? Warranty/Service: 4-year/unlimited-mile basic warranty; 4-year/unlimited-mile full maintenance program; 4-year/unlimited-mile roadside assistance. COMMENTARY: At $350,000 a pop, i expect to outspeed the CHP. NEW YORK/SAN FRANCISCO (Reuters) - The decision by Coach Inc ( COH - news - people ) to launch a clothing line named for its creative director Reed Krakoff is a risky one, especially amid a global economic slowdown that may permanently alter consumers' desires for designer duds and high price tags. While Coach's handbags became ubiquitous during the housing boom as consumers found themselves flush with cash and easy access to credit, the retailer is now introducing lower priced goods to appeal to newly frugal and budget conscious shoppers. Chief Executive Lew Frankfort defended his company's plan to launch a luxury clothing brand, telling Reuters it was "a perfect time" as consumers rethink where and how they shop. Analysts praised Coach for its strong balance sheet, methodical approach to managing its business, and strong stable of talented designers. But they cautioned that success in selling a handbag does not necessarily translate into success selling clothes -- even for a retailer as well regarded as Coach. "Going into a totally new category, which is more challenging, less profitable and to do it in an environment like this, when there's already too many brands, that is extremely challenging," said Milton Pedraza, chief executive of the Luxury Institute. "It's definitely a sport that is not for the faint of heart." Tuesday, Coach reported a lower quarterly profit that matched Wall Street estimates, but its shares fell after same-store sales trends worsened and some investors worried over its increased investment. Coach said it plans to introduce a stand-alone brand next year called Reed Krakoff after its executive creative director. Krakoff, along with Frankfort, oversaw Coach's evolution from a utilitarian leather goods maker to a fashion brand whose products range from bags, jewelry and perfume to scarves, sunglasses and shoes. "We believe the Reed Krakoff label will define new American luxury, which has a distinctive aesthetic at an attractive price point," Frankfort said. Coach is funding the brand, which will be sold in a small number of stand-alone stores, and a limited number of boutiques and specialty stores. It will not be sold in Coach stores. Like other fashion brands, Coach has seen sales and profits tumble in the recession as consumers curb spending. In response, it has rolled out a line of lower-priced handbags that will help cut its average handbag price from $325 last year to under $300 this year. The new Reed Krakoff line expands Coach's reach into clothing, which will range in price from $495 to $1,195. The line also includes accessories, jewelry and handbags. Coach sells a few limited-edition handbags that cost thousands of dollars, but the bulk of its higher-end bags still cost less than $900. Pedraza said Coach has the skills and resources to execute a higher-end brand, just as Japanese car maker Toyota ( TM - news - people ) executed its Lexus brand. But he cautioned that the market for designer clothing is "far more challenging and far more competitive" than handbags. Coach said investments, including the Reed Krakoff line and its expansion in China, will reduce earnings by about 5 cents per share in fiscal 2010, or about the same amount as in fiscal 2009, which ended in June. Independent retail analyst Jennifer Black said Krakoff, who joined Coach in late 1996, has been key to Coach's creative evolution, and that the risks for Coach include not only the money it is investing, but also the potential to divert his attention away from the core brand. "Does he plan to be as involved as he was in the Coach brand?" Black asked. Krakoff, who has a degree in Fashion Design and a Bachelor of Arts in Economics and Art History, has worked for Anne Klein, Ralph Lauren ( RL - news - people ) and Tommy Hilfiger. He has published several books of photography and is involved with New York's Cooper Hewitt Museum and Whitney Museum. Coach executives, who are known in the industry for doing extensive data analysis and market research, said there are separate design teams for Coach and the Krakoff brand and that Krakoff has already been splitting his time for a year. "We're very pleased with his ability to handle both responsibilities," said Frankfort, adding that Krakoff's line will complement, rather than compete with, Coach merchandise. Needham & Co analyst Christine Chen said most designers like to pursue personal ventures, and she dismissed concerns that the new line will drain creative energy from Coach. "Great designers can multitrack. Look at what Marc Jacobs has done for both his own line as well as Louis Vuitton." She also cited Karl Lagerfeld having his own business while designing for Chanel, and how Prada and Gucci began as handbag makers but now have successful clothing businesses. COMMENTARY: I have consulted for clients in the luxury handbag sectorm and luxury end of the spectrum where Coach competes has been hit very hard during the recession. The same can be said for the majority of luxury products, as upscale consumers have curtailed their spending. I have seen this sort of thing before, where a successful brand tries to expand into a different market, believing that its brand name will carry the day and translate into instant success. Coach is already one of the most successful handbag brands, but REED KRAKOFF is not. Just who the heck is REED KRAKOFF anyway? It takes years to establish a brand, so Coach better have a lot of resources at its disposal. The women's apparel business is very competitive and styles can change a dime. Luxury women's apparel has taken a very hard hit during the recession (see previous posts) and this is no time to be experimenting with a new brand in a market that devours new entrants. The Coach brand is very popular and well established. So if I had my druthers I would launch a women's apparel line using the well recognized Coach brand. This would still be a risky strategy, but a lot less riskier than launching an entirely new brand. The advantages of extending your brand into other segments is obviously brand recognition and the customer goodwill and loyalty that comes with a top brand loke Coach. The other advantage is exposure. Coach is sells through company-owned stores and through major retailers, and the more eyeballs you can expose to the clothing line, the better. I certainly wish Coach good luck. As incorporating video onto the Web becomes easier and the quality of video gets better and better, consumers are expecting its presence on Web sites more and more. Video offers so many opportunities for marketers to get their messages across in a more compelling, and more informative, way. But what are consumers looking for in online marketing videos, and how do you go about implementing them for your online communications? Target Marketing spoke with three Web video experts, who offer their insights. “First and foremost, consumers want to, absent of video, know as much about the product or service as they can,” says Matt DeLoca, senior vice president of sales and marketing for The FeedRoom, a New York-based online streaming video and digital asset management provider. “If they go to a Web site that’s very well-structured, has a logical flow, and they can easily search and find what they want, that’s a great starting point, but video is then a richer media type that is easier to comprehend and can go into more depth in terms of the individual nuance of who’s presenting the information.” Essentially, customers want video for its ease of use and ability to inform in a more hands-on matter than text or images can. But they aren’t just looking for a TV commercial plopped on your site. Pippa Nutt, director of online at Northern Lights Direct Response, a direct response agency with offices in Toronto and Chicago, finds video content that walks viewers through a process, such as how to fill out a tax form, ideal for marketing applications. DeLoca and Pournelle agree, saying the more complex the process, the better-suited it is for video. Anything that is difficult to explain or demonstrate in text or images alone should be considered for video. For the younger crowd, it may be a shock to learn that funeral preplanning accounts for 60 percent of business for cemetery and funeral home owner and operator StoneMor Partners of Levittown, Pa. Much of that is due to predictive modeling that StoneMor—the steward of 232 cemeteries and 59 funeral homes in 28 states and Puerto Rico—uses to figure out which consumers would be most interested in settling their earthly concerns prior to death. StoneMor already had been sending consumers direct mail, bearing the original names and return addresses of the neighborhood cemeteries and funeral homes familiar to the prospects—not "StoneMor." But the targeting efforts primarily consisting of profiling and preselecting prospects for funeral preplanning weren't producing much of a response lift. So StoneMor began preplanning its predictive analytics push in January 2008. Then, in November, the company started purchasing data from companies like KnowledgeBase Marketing (KBM) of Richardson, Texas, and plugging the information into marketing analytics software from SPSS of Chicago. Soon, consumers began buying more burial lots, lawn and mausoleum crypts, burial vaults, caskets, memorials, and related services. StoneMor Market Statistician Dan Shin explains why. Target Marketing: What type of data does StoneMor Partners purchase from list companies? Dan Shin: We would like to do predictive analytics in all of the sales channels that we have for our marketing department, [which are direct mail, Web, e-mail and telemarketing]. We were trying to accomplish some of the business objectives. And one of our major business objectives was lifting response for our core product line, which is a direct mail plan for preplanning. So we first implemented and tested it on this channel before we went ahead and implemented it on various channels that we have. The reason … is the other channels require transactional data, or in-house data, historical data—anywhere from response data to purchase behavior. But for the direct mail campaign, because it was prospecting, we didn't have that information in-house. So a lot of the prospect data that we obtained was actually from a third-party vendor like KBM or Equifax, Experian, some of the larger data providers. TM: What predictive model does StoneMor Partners use to figure out who is most likely to be receptive to preplanning a funeral? CLICK THE BELOW LINK TO READ THE REST OF THIS ARTICLE. COMMENTARY: This article has a certain mormidicity that I like. I assume that given my current health situation, I have been added to StoneMor's database and it is just a matter of time before I receive a direct mail piece. As a proponent of predictive analytics, and having consulted in that sector, predicting the future behavior of consumers will become standard in marketing and targeting them.